Dana Survey asks, Who uses the library for What? As the chart above shows, our largest patron group was Medical Students (35%), followed by Other Undergraduate Students (28%). Our lowest Patron Group was UVM Med Center employees (2%). For Purpose of Visit, Study or Coursework (90%) was the most common reason and 70% of patrons preferred to use their laptops as opposed to the library computers. Dana will use this information to plan programs and services at the Library. We will also compare this information with previous years’ patron studies and map trends in library usage. For more information, contact Donna O’Malley at 656-4415. The most popular response came from the Comments question. Twenty-one respondents indicated that they would prefer standing desks. The next most popular response was rectangular tables (19), followed by lounge chairs (9) and lounge chairs with desks (8). Only five people wanted to see carrels in this area. No one was a fan of round tables. Other popular survey suggestions included a fish tank, massage chairs, and kittens and puppies. Another idea was to move all the chairs against the wall from the former Reference area, and fill in the center with tables. As a result of the survey, we have rearranged the existing furniture as suggested and added another rectangular table. We are in the process of scheduling more visits from Tucker the therapy dog. And we are investigating using our mobile monitor to display a fish tank video when it is not in use elsewhere. Survey feedback will also inform future decisions about purchasing furniture for the Dana Library. As a reminder, the Main Desk has nine portable stand-up desks that can be checked out. More questions or comments? Contact Lesley Boucher at 656-4404. In the spring of 2013, Librarians Frances Delwiche and Gary Atwood surveyed students in the College of Nursing and Health Sciences (CNHS). The eleven-question survey asked students about how they spent their time in the library as well as their level of satisfaction with library space, services and resources. 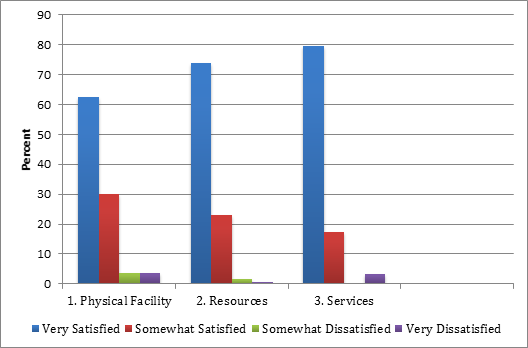 Generally speaking, results show that CNHS students have a very positive view of the physical library and the resources and services that are offered. You know you mean business when you walk in. No messing around at the Dana. You can always get work done there. Even when students did register complaints, they were usually tied to something that they liked about the library. In other words, students would cite a positive library characteristic and then request more of the same when asked about what they would change. Several respondents, for example, stated that they preferred to use the individual study carrels located near the back of the library and wished that they library would install more to ensure availability. From the library’s point of view, this is actually a very positive statement, because it shows that we are providing access to resources that students need and want to use. Although we only heard from a sample of CNHS students, the results were very important. They show that the library is having a positive impact by providing students with a space conducive to serious study and the resources and services to help them complete their work. Of course, they also show areas where we need to continue improving, which we are committed to doing in the months and years ahead. Dana Medical Library staff distributed surveys to everyone entering the Library on April 20 -24 for one hour at different times on each day. 292 people responded to the survey. The purpose of the survey was to determine “Who is using the Dana Library?” and “For what purpose?” The survey asked visitors to state why they were using the Library and allowed them to select more than one activity. 204 of the 292 surveyed said they were using a Library computer, 188 were using a laptop/tablet and 126 did some other activity which included studying and checking out materials. Of the 292 respondents there were 40 College of Nursing and Health Sciences (CNHS) students, 110 other undergraduate students, 55 graduate students, 46 medical students, 19 UVM staff or faculty, 13 FAHC employees, and 9 other. Almost half of the undergraduate students who were not in the CNHS indicated that their area of study was one that might require biomedical sciences library materials or services, for example Biology, Biochemistry, Nutrition, Psychology and Microbiology. Other fields of study mentioned were Business, Political Science, and Engineering. Two unsolicited comments on the returned forms indicated that the students had selected Dana Library because it was quiet and provided a good atmosphere for serious study. Dana Library will use the survey to plan programs and services at the Library.